Mondrian's lifetime work has been an evolution process which has radically transformed the way painting represents reality. From images that reproduce the outward appearance of the world, to which we are accustomed, to compositions of lines and planes of color, a space that no longer seems to have anything in common with our immediate perception of reality. ﻿At the beginning of his work as an artist, Mondrian painted in accordance with the tried and tested canons of naturalistic painting, otherwise known as realistic or figurative. ﻿During the naturalistic phase, the young artist painted a variety of still lifes, a great many landscapes, human figures and single flowers. In the wake of the so-called Dutch luministic painting, as well as the work of Vincent Van Gogh and the Fauves painters, Mondrian begun around 1907 to use colors corresponding more to his inner vision rather than the more immediate appearance of things. A cloud became red against a blue sky if this could better convey the strong contrast a man feels against the infinite space of the natural horizon. ﻿Examination of this period reveals a gradual opening up of the landscapes, which now appear, with respect to the rural scenes of previous years, like boundless expanses. The landscapes are gradually stripped of trees, houses and any other sign of human presence, and seem designed to emphasize the endless space of nature. As Hans L. C. Jaffé observes, "His confrontation in 1909 with the infinity of nature coincides with his joining the Netherlands Theosophical Society, where man's union with the infinitude of the universe was a central problem." ﻿The painter's attention also focused at the same time on individual objects like a windmill, a lighthouse or a church tower. ﻿It almost appears that, on observing the landscape (A), Mondrian tended on the one hand to extrapolate the natural element, which he began to identify with a primarily horizontal space (see the group of landscapes shown above) and on the other to accentuate in the opposite direction, i.e. the vertical, the shape of the non-natural spaces, the artificial, man-made spaces (windmills, lighthouses, churches). A church tower which in 1899 is only part of the natural landscape (B), becomes years later the dominant motif of the painting. ﻿The painter appears to focus in this phase on expressing contrast, both with the alternation of opposing thrusts and through the use of strong colors. Yellow is opposed to pink or green; red is opposed to blue; horizontal compositions are juxtaposed with others characterized by marked vertical development. ﻿Mondrian was a great painter capable of transforming the surface of the canvas into a precious artifact as regards richness of texture, combinations of color, and dynamic balancing of the composition. It is essential to see the original works in order to appreciate all their beauty. His aim in painting those landscapes and buildings was not, however, solely to reproduce the fleeting appearance of things. The artist read and interpreted those objects as plastic symbols of a deeper reality, as visual metaphors of existential meanings. ﻿While horizontal extension predominates in the landscapes and vertical development in the buildings, the two opposing directions interpenetrate in the figure of a single tree which is another recurrent motif of this period. What the artist sees in the figure of a tree is a vertical (the trunk) interacting with horizontals (the branches). The branches expand toward the sides of the canvas while the trunk leads them back toward the center. Space simultaneously expands (the infinite natural landscape) and contracts (the finite artificial objects created by man) in the figure of the tree. In the tree, the horizontal (symbol of nature) is concentrated in the vertical (symbol of man). The trunk would thus constitute a metaphor of the unifying consciousness of man addressing the infinite variety of the world which is here symbolized by the branches. In his writings, years later, Mondrian would talk about the natural as identified by the horizontal and the spiritual by the vertical. The subsequent abstract compositions of horizontal and vertical lines are already present in the figure of a tree, albeit in a form still veiled by appearances. In this phase the tree becomes the visual metaphor of a search for equilibrium between contrasting entities such as horizontal and vertical, respectively symbols of nature and man, that is to say, the manifold space of nature and the spiritual quest for unity. ﻿Why does the Dutch painter see nature and man as contrasting entities? Mankind is part of nature but distinct from it at the same time. There is often conflict in the life of the individual between the natural instincts and what we call intellect, reason or mind, and hence opposition between a part of us that is closer to the natural world and another that separates us from it and often clashes with it. The history of mankind has been a slow and laborious process of emancipation from natural conditions ever since the Stone Age: from huts of mud and straw to houses of glass and concrete; from oxen to tractors; from an average lifespan of 35 years to one of 75. In striving to improve their living conditions, human beings alter the landscape with architecture and transform nature into artifice (the countless objects and tools used for human life today). How are we to define artifice? Is it a natural product or only a human product? And if mankind is part of nature, are the plastic, concrete, and aluminum used to alter the landscape and move more quickly between the continents the result of natural evolution? It seems as if nature creates a "non-nature" through mankind. A curious contradiction. ﻿Between 1911 and 1912 the solid figure of the tree was shattered with the Cubist transformation of space; object and space interpenetrate and thus put an end to the unifying function of the trunk, which dissolves and tends to become one with the many branches. While this happens, space can be seen to thicken toward the middle in some canvases. Reading the above four paintings from left to right, this can be seen in the second painting, where a touch of ocher highlights two curvilinear signs that are more closely connected than the others, as though in an effort to hold the space together, in the third painting with two semicircles in the central area that appear designed to evoke a synthesis of the composition, and in the fourth painting where an oval shape unifies the whole composition from outside. Having lost the synthesis metaphorically evoked with the trunk of the naturalistic tree, the painter is searching for a new sense of unity in the cubist type of space. The relationship between horizontal and vertical which we see expressed in a rather univocal and static way in the naturalistic tree ( A), multiplies (B) and takes on ever changing combinations (C). It looks like the painter wishes to express now all possible relationships between the opposites in the attempt to evoke in one single image all the natural landscapes (horizontals), the artificial objects (verticals) and the trees (horizontal and vertical) he had painted during the naturalistic and expressionistic periods. During the Cubist phase Mondrian seems intent in finding an "inner landscape" capable of evoking a universal image of the outer world. In D we see again an oval which gives a sense of unity to the multiplicity of elements. ﻿For the italian Futurist and the french Cubist painters the goal was a dynamic representation of the visible; for Mondrian Cubism was above all a key to detect a more permanent reality beyond the everchanging appareances of daily life. What we have seen so far is confirmed by a new group of works Mondrian paints in 1914. A group of sketches, drawings and gouaches inspired by the sea and by a pier jutting out from the beach into the waters. The latter are therefore also called Pier and Ocean. On observing the four paintings, we see a predominant horizontal extension (similar to the natural landscapes of 1909-10) compenetrating with a vertical (the pier, that is to say a non-natural element such as the buildings of 1909-11). F and G: The pier develops from the bottom in the center of the composition (like the trunk of the tree). Same as the trunk, the vertical (symbol of the spiritual) tends here to concentrate the horizontal endless expansion of nature. The interaction between nature (the sea) and non-nature (the pier) generates a multiplicity of perpendicular signs; a variety of situations where each aspect prevails for a moment onto the opposite one (H). Horizontal and vertical, that is to say, nature and spirit, matter and thought, find endless possible relationships. The variety of signs finds a more balanced and lasting situation when the opposites acquire the same value; this happens in a square form which is namely an equivalence of horizontal and vertical. 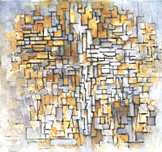 Looking at the four paintings in a sequence, we can see how the square progressively generates in the upper central part of H.
That square is born out of the horizontal (the natural landscape) and the vertical (the human interaction with nature) compenetrating in the structure of a tree and now emerging in an abstract form. 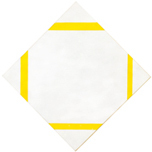 That square proportion was to inform nearly all the works produced by Mondrian after 1916 (L, M, N, O, P, Q, R, S). L: this composition can be read as the development and variation of an ideal square that changes in color, size, proportion and position to suggest a manifold space. The variety of shapes and colors seem to reduce towards the central area and find a synthesis in a white square emerging from the background in the centre of the composition. This impression is borne out when we consider a later work (M) in which a large square form constitutes a synthesis of yellow, red, blue, gray and black. At this stage Mondrian identifies the natural aspect with yellow, red and blue whereas white, gray and black symbolize the spiritual. Verticals, gray and black (symbols of the spiritual) as well as horizontals, yellow, red and blue (symbols of the natural) compenetrate in a large square area. ﻿The square, sketched out as a draft in Pier and Ocean, opens up to color over a span of five years (L , M). A postulate of consciousness, i.e. the spiritual, unity opens up to the natural world (yellow, red and blue) but fails in doing so to maintain the degree of visibility the artist requires. The large square we have detected in M was probably not evident enough to the artist eye. In order to be more visible, the unitary synthesis thus reverts to expression through a homogeneous white field (N) while the colors emphasize the manifold aspect from the outside. In this work an etherogeneous variety of yellow, red, and blue is counterbalanced by gray, black and a white where the opposite directions find a moment of more stable equilibrium. See other works of the same type. Visualize as a single sequence from 1909 to 1920. Neoplastic space was born out of this transition. 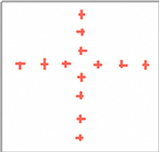 ﻿The square reverts to white (N) but, a year later, the unitary synthesis opens up again to a variety of possible configurations (O): We see here a large red square (1); a smaller gray square crossed by a vertical segment (2); a third square crossed by an horizontal line (3); a black square (4). We are confronted with four different types of square. The spiritual quest for unity (the square proportion) opens up to the endless variety of nature (areas of different size and color). Unity and multiplicity compenetrate (as we have seen in M) but now unity maintains its visibility. Why does Mondrian need to express multiplicity and unity at the same time? We can detect an interaction between multiplicity and unity in some early naturalistic works such as a landscape or a still life. We have seen an analogous interaction during the expressionist period in the form of a tree where the trunk unifies a variety of branches. In a new and more dynamic way we see the same interaction during the cubist phase with Pier and Ocean where a square unifies in more balanced and stable form a multiplicity of different and precarious relationships between opposite drives. Notice how the Pier and Ocean central large square is sourrounded by smaller, less stable squares (same as in O). All this is not just a coincidence but means something precise which prompts reflection. We shall now go through a very synthetical overview and see how the entire Neoplastic period (1920 - 1944) is a ﻿continued examination of the interaction between the multiple and the one in ever-greater depth. The square form which has been generated between 1912 and 1921 becomes a constant feature of all the canvases Mondrian paints from 1921 on. The square is a constant feature but in a state of continuous evolution. The main central square expressed with a white field undergoes duplication (P) to appear once in a larger form in red and once in a smaller form in blue. Two squares appear to contend for the space now. The squares remain open on two sides. Small black segments or accents of color serve to redistribute the weight and keep the whole in a state of dynamic equilibrium. See other works of the same type. See Q. The peremptory presence of the large square, which occupied the center of the composition in 1920, gives way to two perpendicular lines and this makes the center of the canvas more dynamic (R). See other works of the same type. ﻿Neoplastic space evolves through the 1920s. On the one hand, the closed square of 1922 opens up to color and multiplies (P, Q). On the other, the field inside the square remains whole but is reduced in size and exposed to the dynamic influence of two lines running through the center of the canvas (R). The common denominator of these compositions is the effect of making the equivalence of opposites more dynamic and relatively multiple. Open the spiritual quest for harmony, balance and unity to the multifarious aspects of nature and human existence. The composition seems to undergo distillation and deft calibration in some of these canvases. The parts express an intimate sense of permanence and duration while everything is nonetheless on the verge of flux and motion. The impending inconstancy of life transforms our equilibriums, our definite squares, into variable entities. The play of equilibrium regards not only form but also very subtle vibrations of color. The surfaces appear to have been painted there and then, thus suggesting intuition more than cool elaboration. The fields of red are splendidly rendered, as indeed are those of white, which have none of the flatness unfortunately seen in reproductions. It is not easy to give an adequate description of the painterly quality of these canvases, the masterly combination of hues, the fine textural layering, or touches such as a sparkling note of yellow. It is also and perhaps above all essential to see the original canvases, which are endowed with energy that no reproduction will ever be able to convey, energy imparted by the man who brought them lovingly to life. 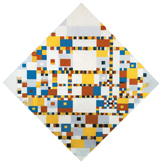 ﻿A further variation on the theme of the painter's drive for a dynamic transformation of the equivalence of opposites is to be found in the lozenge compositions Mondrian produced between 1921 and 1933 the synthesis of which is S.
﻿In the rectangular canvases on which the painter worked at the same time as the lozenges, the square opens up, undergoes interpenetration with the lines, moves off-center decreasing in size, and becomes red or blue in some cases, but never attains expression with such a degree both of articulation and of synthesis as in S.
﻿With this composition the artist appears to have given material expression to an idea that had guided him, canvas after canvas, for roughly twenty years of work, namely to express the multiple in unitary form and endow it with the stability required by consciousness without, however, causing it to atrophy in overly rigid and constant geometric forms. The artist felt for a moment that he had achieved his objective with a square undergoing transformation while remaining relatively stable. Nevertheless, if we compare S with the previous works and in particular with those produced up to 1920, it appears immediately obvious that by 1933 the multiple aspect of Neoplastic space had been considerably reduced almost to the point of elimination. Around 1930 Mondrian painted in black and white or with one or two colors inside predominantly white fields. ﻿With colored lines changing also in thickness, the square we see in S alludes to multiplicity without, however, showing it in all of its far greater breadth. ﻿Between 1922 and 1933 the space of external reality had undergone marked internalization in the far more condensed forms of thought; the physical seemed to be expressed in excessively mental terms. ﻿The painter was soon to realize that his canvases did not convey all of the variety perceived by the eye in nature or urban space, the rich and multiform aspect of color previously captured with his dunes and trees, his Cubist works, and his early Neoplastic compositions. While S can therefore be regarded as a point of arrival, at the same time, as in other moments of Mondrian's artistic development, the work also represents a new point of departure. ﻿Observation of the four works T, U, V, W in sequential order reveals a gradual increase in the number of lines, which divide the space of the canvas into a growing number of parts. The tendency observed during the 1920s toward a space of ever-greater rarefaction and synthesis gradually gave way to the opposite tendency, whereby an increasing level of articulation and complexity was progressively reintroduced into the Neoplastic canvases as from 1933 (from T to Z). ﻿The two horizontal lines running through the central area of T become four in U. The field inside the square form is no longer white here but yellow and presents a vertical segment echoed by an external horizontal segment in the lower section. The square form appears in a state of unstable equilibrium between an internal vertical and an external horizontal. In this respect, one should recall that Mondrian saw the vertical as a symbol of the spiritual and the horizontal as a sign of the natural. The linear segment inside the square seems designed to indicate the beginning of a process of interpenetration between square and lines. ﻿Between 1930 and 1937 we move from a sharply defined and definite square (R, S, T) to one placed in tension by a vertical and an horizontal segment (U) and finally a "square" in a state of becoming that has undergone total interpenetration with the lines and is expressed as a continuing variation on itself (V, W). Again let me remind that the process was much more complexed and articulated than that. To escape the war, Mondrian had moved from Paris to London in 1938 and by the end of 1940 he finally arrives in New York City. On the other side of the Ocean the uniformly black lines were then transformed into lines of color. The blossoming of colored lines constitutes a further development in the process of opening up unity to multiplicity that began with U, V, W.
X : The intersection of 23 yellow, red and blue lines generate a variety of rectangles and squares which constantly change in size, proportion and color. We thus see fully achieved here the process of compenetration we have observed from 1920 to 1942 between a large, white square field evidenced by black lines and areas of different size, proportion and color which had the function to put the square in a state of asymmetric balance. In 1942 the idea of square finally attains more dynamic expression through constantly changing measurements, proportions, and combinations of color. The square is now always different in appearance but always a square, just as the waves of the sea are always new and different but always made of water. In 1942 the black lines were illuminated with yellow, red, and blue (X). As a result, the colored planes Mondrian had used in almost all the previous compositions disappeared. In the Neoplastic compositions, planes express finite space and lines virtually infinite continuity. Previously reserved exclusively for planes, color was applied to line in 1942, at which point Mondrian found himself grappling with compositions in never-ending development. In X the dynamic aspect seems to overwhelm the more measured and constant aspect previously expressed with planes; infinite space prevails over finite and multiplicity over unity. The eye scarcely has time to identify a more stable relationship before finding itself immersed in the dynamic and continuous flux of lines. Even the segments that had always been present in the previous Neoplastic compositions disappear in X, which lacks a finite and more durable component to counterbalance the dynamic movement of the lines and thus suggest a certain degree of spatial permanence. While the need felt as from 1933 (S) had been to open up the unitary synthesis to multiplicity, it was now necessary (1942) to re-establish a greater degree of synthesis and constancy in a space that had undergone considerable multiplication in the meantime and continued uninterruptedly with the lines alone. While working on other compositions which will remain unfinished, Mondrian makes some sketches for a new painting (Y) he will then title Broadway Boogie Woogie. For a detailed examination of Mondrian's last accomplished canvas please refer to How to See Broadway Boogie Woogie. ﻿Mondrian's pictorial evolution shows that, contrary to common belief, the artist had no intention whatsoever of forcing existing reality into rigid geometric schemata but rather of making his geometry as open and flexible as possible. In Broadway Boogie Woogie every form is born, grows and develops as every natural form does. As in natural space, nothing lasts forever; no entity is pre-established but becomes such in that particular situation, in that particular positional relationship with respect to the other forms undergoing reciprocal determination. Every point of Broadway Boogie Woogie is unique and unforeseeable but, at the same time, part of a process that brings all of the elements together like a universal rhythm. A fluid space that gives concrete form to becoming more than being, to relations more than the individual things in themselves; a geometry that is anything but rigid, cold, or exclusively rational; a space that strikes me instead as very similar to life. For a detailed examination of Victory Boogie Woogie please read this. The above is a synthetical version of Michael Sciam's studies on Piet Mondrian's oeuvre. Further details can be found in this web site under mondrian explained by sciam. You can also ask for a paper copy of Sciam's studies by sending a request by mail.